THOMAS JEFFERSON. 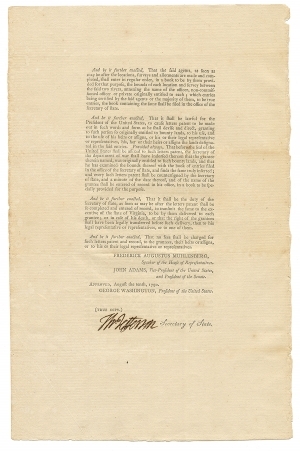 Printed Document Signed as Secretary of State, An Act to enable the Officers and Soldiers of the Virginia line on Continental Establishment, to obtain Titles to certain Lands lying north west of the river Ohio, between the Little Miami and Sciota, August 10, 1790. [New York, N.Y.: Francis Childs and John Swaine]. Signed in type by George Washington as President, Frederick Augustus Muhlenberg as Speaker of the House of Representatives, and John Adams as Vice President and President of the Senate. 2 pp. 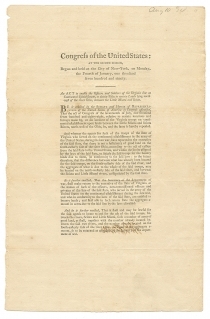 This 1790 act, signed by Jefferson as Secretary of State, addresses a conflict that developed from a provision in the 1784 act accepting the cession. During the Revolutionary War, the Virginia legislature had set aside a large tract of land southeast of the Ohio River, in present-day Kentucky, from which to offer land bounties to officers and soldiers serving in the state militia or in the Virginia line of the Continental Army. When the state agreed to cede its claims to western lands, it did so with the caveat that territory between the Scioto and Little Miami Rivers, in present-day Ohio, be set aside in case the original bounty tract proved insufficient. In the summer of 1787, with signs that the first tract would indeed be too small, Virginia began to lay out bounty land between the Scioto and Miami rivers. The Confederation Congress, fearing that Virginia was encroaching on its new authority, passed a resolve on July 17, 1788, invalidating any “locations or surveys” in the area until the state proved the deficiency. Virginia protested, but they also submitted the required reports. On August 4, 1788, the First Federal Congress passed this repeal of its earlier resolution. The controversy continued though. Because this new act specified the procedures by which veterans could obtain land in the second tract, Virginia officials again argued that the federal government was impinging on their authority. Virginia veterans, meanwhile, complained that Congress had made it too difficult for them to obtain their promised grants. Congress finally responded on June 9, 1794, with an amendment to this act that eased the requirements. Following a law passed on September 15, 1789, Thomas Jefferson, as Secretary of State, signed two copies of each law, order, vote, or resolution of Congress for distribution to the executive of every state. At the time this resolution was passed, there were 13 states, so it is very likely that Jefferson signed only 26 copies to be sent to the governors. Thomas Jefferson to Samuel Huntington, January 17, 1781. Editorial Note: The Virginia Cession of Territory Northwest of the Ohio.